The Kroog has a great Op-ed in today's Times, it's a point so obvious that you wouldn't think that someone would actually have to say it: how can you look at a plan to save the planet and decide that it's "too expensive"? Wow, went to look at movie times for this weekend on the off chance we could get to one, and read that the owners of the historic Varsity Theater in downtown Chapel Hill went dark after last night's shows and closing its doors. Very sad! I mean, it was not perfect -- uncomfortable seats, films starting without sound occasionally, generally shabby feel, but still, it was an old theater in the middle of town and i saw tons of great movies there...in recent years the "Hollywood" quotient has been higher than in the past, but in the 80's it was the only art house theater in town, a high school weekend ritual...i definitely sat through multiple viewings of fine films like "Stranger Than Paradise," "Liquid Sky," "Betty Blue," "The Thief, The Cook, His Wife and Her Lover," and much of the David Lynch oeuvre at the Varsity. So many more through the 90's and was there more recently to see "Slumdog Millionaire," "Milk" and something i can't remember...there are other options in Chapel Hill, but the screens are smaller and the vibe slightly...antiseptic? Tough times. The Indy has the story. Michael Jackson and Farrah Fawcett both passed away on the same day yesterday, both icons of my youth and both sad at the end in different ways. Farrah was publicly sick for a long time, so that was sad but not sudden. But hearing about Michael Jackson, though i certainly wouldn't have described him as "healthy," was more shocking news than i would have anticipated, more affecting. With Farrah, i was a boy in the 70's, of course i had "The Poster," alongside a more democratic poster of all 3 Charlie's Angels (original lineup only for me). And with Michael i really thought of him as a cartoon for a long time since i would watch the Jackson 5 cartoon on saturday mornings. Post-J5 it's incredible to think about the impact he had on pop music then and into the future, basically with just 2 albums -- Off The Wall, the best, and Thriller, the best-selling. Quincy Jones' production on both is visionary in itself, and coupled with Michael's bizarre energy and delivery and voice..."Rock With You" was certainly a soundtrack to my 10- year-old summer, and though by the time Thriller came out i was really just into rock and metal, i was still riveted by the videos and the "Billie Jean" performance on the Motown TV special. But already, though this was pre-skin bleaching and all the craziness, he seemed like he was from space or something. The art he was making was compelling but i never felt a personal connection to the human being, which is why it's still hard to understand the global reach of Michael Jackson as a phenomenon that filled stadiums (years after he'd become a reverse-shadow of himself) and is now bringing crowds of people into the streets weeping. All that can't be about the dancing and the glove and the hits, so what is it about? I don't claim to get it. I do know that with Farrah and Michael both, though they occupied some sort of pop culture place for me as a kid, and i would never turn the dial on "I Want You Back" and a bunch of other songs, i lost track and didn't think much about either after the early 80's. But when i did i had a vague feeling that i wished that both would turn themselves around, stop embarrassing themselves, return to civilization, return to earth basically; i was rooting for them to be what i thought they were when i was 10. The Field - Yesterday and Today (Kompakt) this is a double LP in a heavy gatefold sleeve, which also comes with the CD thrown in for good measure, but i find that listening to a side at a time rather than the full hour or whatever it is, is how i enjoy this record most. super pretty and light and completely electronic but still warm. like a New Order vibe without the pop songs. I'm especially enjoying "The More That I Do" which reminds me of the Cocteau Twins...in fact the vocal sample could be Liz Frazier for all i know. Funny interview here from 2007 with Mr. Willner, who reveals his surprising desire to sing like Glenn Danzig. Open Strings 4-LP Box (Honest Jon's) subtitled "Early Virtuoso Recordings from the Middle East, And New Responses" this is a beautiful black and white package...the early recordings, from the 1920's Egypt, Iran, Iraq, and Turkey and transferred from 78's, are so amazing, i haven't even gotten around to the responses yet (by the likes of Richard Bishop and Bruce Licher). I wish there was more information about the original artists, but maybe the information doesn't exist? Governor of South Carolina taking the whole GOP "less government is better" thing further than usual. UPDATE! Gov Sanford has been located! Jeez people, he was just hiking the Appalachian Trail as his staff was saying the whole time, why is everyone freaking out!? The trail is much longer than i realized! gonna be 100 degrees here this weekend...the summer is here. before you leave the office today call your Senators and tell them that any meaningful healthcare reform must include a public option! and have a great weekend. Gonna be awhile before Jammie Thomas-Rasset can afford to actually pay for music she'd like to hear, as she now owes the RIAA nearly $2 Million for illegally downloading 24 songs on Kazaa. Uh, I am a musician and have a record label, so yeah there are people out there stealing from me all the time, but i don't think this is the way to remedy that situation. Update Chris Knox's situation: there is a blog run by family friend Roy Martyn where you can find out what he's been having in the hospital since the stroke (no beer yet apparently) and you can leave a message for Chris and his family. with the GOP at it's weakest point in decades, why on earth the Dems would cave on anything, but particularly a Public Option for healthcare in this country, i simply can't fathom. Obama stood up for the idea yesterday to the AMA, but my fear is that a speech like that is that so later the White House can say "Hey, we tried!" as they sign a watered down healthcare restructuring that lacks any of the bold strokes we need on the issue. 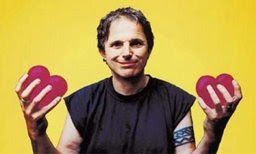 Everyone send all your best thoughts and love down to Chris Knox and his family -- sad news out of NZ this weekend that Chris has had a stroke and remains in the hospital. hard to say what "the latest" is, but reports like this one say that Chris still can't speak (not unusual after a stroke and can be remedied through therapy) but worse, may not walk again. hopefully this is a worse-case scenario and that as his recovery progresses (he had surgery Friday night) Chris will outstrip the predictions of the docs. I didn't learn about Chris' early band The Enemy until later, but the Toy Love reissue came out when i was in college, and i simultaneously got the Tall Dwarfs' "Nothing's Going to Happen" and the "Slugbucket" EP and it was all so unhinged compared to the other Flying Nun stuff i loved, beautiful in a different way, Chris (and Alec in the Dwarfs) really created his own world. His solo albums were as good or even better. Superchunk had the good fortune to tour with Chris doing his solo set here in the US and it was amazing watching him gather a crowd of rock fans waiting for Superchunk into the palm of his hand with great songs and humor and flip flops and a headset mic. He's a true musical hero of mine and i look forward to Chris' post-recovery music! Kingsbury Manx - Ascenseur Ouvert! 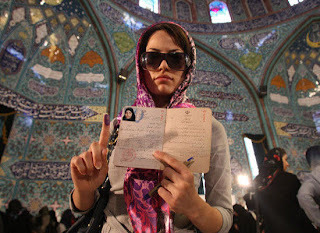 my knowledge of Iran is thin, limited to my memories of the hostage crisis as it played out on TV and in the papers, Marjane Satrapi's books, and some great Iranian films i've seen, but this election today seems like a really exciting time in Iranian politics (even though the President isn't the most powerful person in the country there)...but am i wrong in thinking that if this thing is at all close, Ahmadinejad is going to just go around reality and declare himself the winner? and of course the bigger question is, if he loses whether today or in a runoff, does anything really change there? awesome photo courtesy Huffington Post coverage of the election. The Fall - Totally Wired:The Rough Trade Anthology i am sure i have all these tracks scattered throughout my record collection on singles and albums and eps, but i found this 2-disc collection used and couldn't pass it up. you forget how craptacular the sound is on these old tracks, and how beautiful that crappy sound is! this comp has one of the most powerful Fall tracks -- "Leave the Capital" from the Slates 10", what a great song. i never think of GBV as being Fall-influenced but there are some total GBV-sounding lo-fi moves on here, it would make sense if Pollard was a fan, i don't know if i've ever asked him. Dirty Projectors - Bitte Orca man this record sounds GOOD. one amazing thing about Longstreth's progression with the band to this point is that earlier records, though they had stunning moments (and Rise Above i think fantastic pretty much all the way through), were also so dense musically / conceptually to the point of alienating even the most willing listener, but from the first groove of "Cannibal Resource" this album is positively inviting and even sweet. Allen Toussaint - The Bright Mississippi hard to believe this is his first solo album in 10 years, because Toussaint has been pretty visible over the last decade, but apparently it is. it's also a different setting for one of the great soul songwriters & producers -- a pretty straight jazz date with Toussaint on piano of course but joined by the likes of Don Byron and Marc Ribot. i need to spend more time in a quiet place with this record (not ideal Merge office listening) but from what i've gathered so far it sounds lovely. Produced by Joe Henry. Sticksman-in-demand Jon Wurster has found time between bashing his drums to keep a "tour diary" whilst on tour with AC Newman. I wonder if Jon's tour diary was a small leatherbound book with a lock on it so Carl couldn't peek at Jon's scribblings on how Carl is always trying to slow down and speed up and slow down in the middle of songs? It takes place in the UK so you know bad stuff happens. Read it and i think you will laugh. Unless you are a subscriber to "Nuts" magazine. ...is a Game 7 in the Stanley Cup Finals, and we have one....for the Pens i think Scuderi made as many saves tonight as Fleury, including an amazing sequence at the end with an empty net in the Detroit end and the Wings putting on the pressure. Fleury had his own dramatic saves, stoning Cleary on a breakaway toward the end of the game. Game 7 is going to rule. As Panger pointed out on the post-game, Fleury is great at home, not so great away, and Joe Louis Arena is tough, bouncy boards behind the goals and all. Can he pull it together? does the GOP understand what they look like when Republican Senators write the White House to demand that there NOT be a public option for healthcare in this country? it's safe to say that everyone besides Red Wings fans wants, needs, a Game 7 in the SCF. the way the Pens were making the Wings look old and tired in Game 4 took me by surprise, but then Detroit flattens them back in Game 5 and now i simply don't know what to think. all i know is that last night's OT in the Lakers-Magic game had the least drama of an OT finals game that i can remember...once the Magic missed their buzzer shot you knew it was all over. and without an interesting NBA finals we're looking at the dog days even sooner than expected. which is why we need a bit more hockey! first of all, i'm so out of whack apparently that yesterday i was under the impression that it was Thursday (note the title of yesterday's post). maybe i even convinced some unlucky blog reader that yesterday was Thursday, with the unfortunate effect of them then waking up today singing the theme song to TGIF, the Movie, only to discover that yes, it's still only Thursday. that probably didn't happen though. 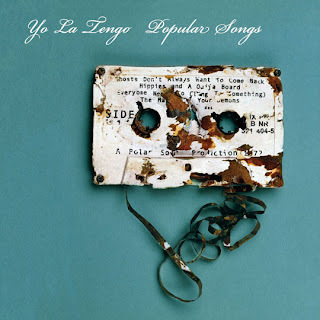 anyway, my Thursday Surprise was discovering by casually hopping over to You Ain't No Picasso that there's an mp3 from the NEW YO LA TENGO album to listen to! i haven't even heard it yet but i can safely assume it will be great because well, that's what the new yo la tengo always is. i hope that's really the cover of the new album, too. UPDATE: just to confirm, upon listening, i do love the new YLT song. it's a tight little grooving number with some Augie Meyers organ jabbing, an excellent backup vocals arrangement and a funny dropped-in interlude in the middle. it's got a good beat and you can dance to it! only disappointment is that despite the title "Periodically Double or Triple" it's not about baseball. a minor gripe i will admit. Dirty Projectors - Bitte Orca (streaming from NPR)...as predicted, i love this. this is the kind of record that simultaneously makes me want to both quit music and make a record. hey while you're on the internets check out this fine blog -- Hook's Hidden Gems -- basically a guy putting up semi-obscure stuff from his record collection and opining on the music, mostly jazz and mostly great stuff! this has certainly been noted elsewhere, but it's galling the way the most vocal elements of the right wing, supposedly anxious to pursue terrorists around the world (even that is debatable), is anxious to forgive them and even justify their actions here at home. despite some half-hearted condemnations of the murder of Robert Tiller, victims of domestic terrorists like Randall Terry and his followers are just reaping what they sow apparently...horrible. my friend Josh Diem wrote a good piece yesterday for his blog Young Crumudgeon.